The generalised term Hydro Power is one that can be used to refer to any type of water energy. Hydro power is not a new renewable energy technology, it has been used for centuries and along with the burning of wood for light and heating, water power was used as the main source for generating mechanical power with river water being diverted to rotate large water wheels. River water flowing down a mountain from a higher level to a lower level consists of potential energy within itself, and because of this drop, called the “head”, it is converted into kinetic energy while flowing downhill. Jointly these energy forms contribute to what we call “Water Power”. It is a renewable source of energy because it is renewed continuously in a natural way. It is estimated that hydro power stations called “Hydroelectric Power Plants” are the largest contributor of electricity from renewable sources worldwide and it is estimated that over 15% of the world’s electricity is generated from such hydroelectric schemes. Hydro power plants are also termed run-of-river power plants, uses the natural flow and elevation drop of a river to rotate a water wheel or hydro turbine. 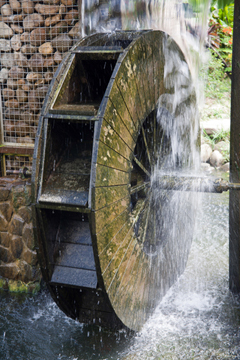 The water wheel is a simple machine that converts one form of kinetic energy, the movement of flowing water into another kind of kinetic energy, the rotation of a shaft. Generally in a small scale hydro run-of-river scheme, water from a river is diverted by the building of a diversionary weir which diverts water from a river into an intake which then passes through a hydro generator and the water is then returned back to the original river some distance below. Hydro power is produced by simply using a body of moving water to turn a water wheel which is located below a source of flowing water. A water wheel, which is a type of paddle wheel attached to a fixed rotor, or axle, and placed in the current of a river or stream, captures the flowing water in buckets attached to the wheel and the weight of the water causes the wheel to turn. Water wheels convert the potential energy (gravitational energy) of the water into motion which then turns the turbine and the revolutions of the turbine convert mechanical energy through the generator into electricity. The potential of a site to generate adequate amounts of electricity is dependent on three main factors: the head of water, the flow of water available and the rainfall characteristics of the site, because with no rain there’s no water. The head of water refers to the vertical drop from the schemes intake at the top to the position of the turbine or water wheel at the bottom. The flow of water is normally expressed as a volume of water in cubic metres per second or litres per second and refers to the quantity of water used by the scheme to turn the hydro turbine. The power extracted from the water depends on the volume of water and on the difference in height between the source and the water’s outflow. Therefore the amount of hydro power produced is proportional to the product of head x flow. One of the biggest advantages of a hydro power plant is its ability to store energy. The water in a reservoir is, after all, stored energy. Water can be stored in a reservoir and released when needed for electricity production. But run-of-river hydroelectric power plants are those with smaller reservoir capacities, thus making it impossible to store water. Nevertheless, as long as the river has adequate volumes of water, significant amounts of hydro electricity can be generated. The downside is that much more power is generated during times when seasonal river flows are high, during winter months of melting snow and much less during the drier summer months. With a growing DIY community and an ever increasing interest in environmentally friendly “green energy” alternatives, there are a lot of DIY’ers and hobbyists who have built their own hydroelectric power plants from old water mills, or from kits or from scratch. After all, all you need is a river or stream with enough water running through it at the right flow rate to feed into turbines and generators, and you can set up a hydroelectric scheme for your home or business. Just like you can with a solar energy and/or wind energy systems. Small scale hydro plants may be connected to conventional electrical distribution networks as a source of low-cost renewable energy. Alternatively, small hydro projects may be built in isolated areas such as mountain cabins, farms etc, where there is no national electrical utility grid. Micro hydro systems complement photovoltaic solar energy systems because in many areas, water flow, and thus available hydro power, is highest in the winter when solar energy is at a minimum. The advantage of a hydro power scheme is that like other renewable energy generation, pollution and consumption of fossil fuels is reduced, but is still typically an environmental cost to the manufacture of the water wheel and generator. It is a renewable source of energy saving fossil fuel reserves. It is a clean power source, because there is no harmful air pollution or radioactive waste problems associated with it. Since water power produces no carbon dioxide, it does not contribute to greenhouse gasses and global warming. Water wheels and hydro turbines can be used for low-head electrical power generation. Average cost of generation, operation and maintenance over lifetime is lower than any other sources of energy but there are high initial capital costs. Hydro power has a higher efficiency (over 90%) compared to other types of renewable energy systems. The availability of hydro power is restricted to hilly or foothill areas due to the availability of water and head. In hilly areas it is difficult to transport heavy equipment and machinery required to build the plant. In northern and mountainous climates, water wheels can freeze and stop in cold weather, when the water supply is frozen. Extra investment for installing long cable runs and transmission lines from the generator to where the electricity is needed. Frequently involves impoundment of large amounts of water with loss of habitat due to land inundation. Rehabilitation and restoration of people and activities in submerged areas is always a matter of concern. One of the main drawbacks of installing water wheels or water turbines to generate hydro power, is that building hydro power plants even small-scale, micro-scale or as part of a DIY project can be expensive for the amount of energy it can produce. Most of the expense lies in the installation of good quality turbines needed to generate the power. Such as the gearboxes needed to convert kinetic energy into mechanical energy, and the generators needed to convert the mechanical energy into electrical energy. However, if the flow of the water is high, the amount of power generated is more likely to justify the cost, but if the rivers flow is low, the amount of power generated may not be worth the cost. For more information about “Hydro Power” and how to generate your own electricity using the power of moving water, or obtain more hydroelectric power information about the various small scale hydro power schemes available, or to explore the advantages and disadvantages of hydro power, then Click Here to order your copy from Amazon today about small scale and low head hydro power systems which can be used for generating free electricity. Thanks for listing the pros and cons of choosing Hydroelectric option as a power source versus other renewable energy options. I can definitely see how it would be necessary to assure that the river you’re using has a sufficient amount of power to use for hydro electric conversion. I’ve always been an advocate for clean energy sources. It seems like hydro electric power could be a very environmentally friendly form of energy. Hi, Is there a general rule of thumb for the minimum gradient required for a penstock or pipeline which conveys the water to the turbine house. For instance would a penstock of around 700m in length for a head of 50m (gradient ~ 7%) have a too low gradient?